This is a quote that I feel helps to describe how I feel about the film adaptation of Veronica Roth’s Young Adult Dystopian novel Divergent. This is a film adaptation of a novel that is wonderfully realised – a futuristic Chicago is impressive, as are the film’s sets – even has wonderful performances from its cast, but the thing that really let’s the project down is its script. 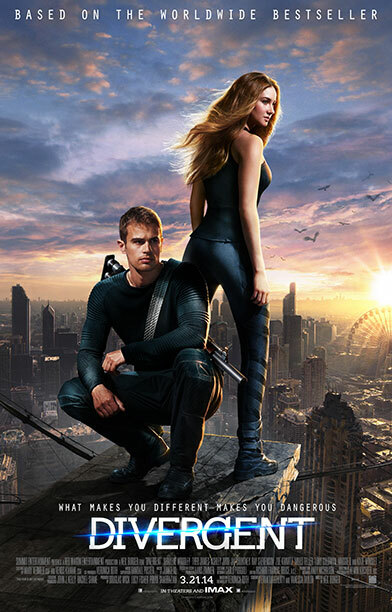 Divergent feels rushed and quickly manufactured to get out into the world for the money. You might be saying, “well hang on, aren’t all Hollywood films like that?” but the difference is with some of them, there exists enough heart and care into the product to make it have an impact. Divergent follows the plot faithfully enough. Avid fans will scoop it up like their favourite ice cream and have at it and all the power to them; the beauty of any medium is the difference of opinion. My opinion is that the script lacks the brutality of this future and the little character beats that made the story all the more moving, interesting and engaging. The film feels rushed because it seems so busy in getting from Sequence A to Sequence B that it neglects something as simple as settling into the setting, letting it breathe and getting to know the characters. I’m not one of those rabid fans that scream, “Just film the entire book!! !” I understand book and film are two different mediums and where a novel has the time to jump into the minds of characters, a film has a certain amount of time to get in and tell the story. Yet, if the film took perhaps twenty more minutes to add a line of dialogue here or a scene here that explores the mentality of one character, it would become a better film. I don’t see any other fault in anything else in production here. Neil Burger directs the film and it is stylish and energetic. Futuristic Chicago is a sight to behold and this is a world that intrigues me and is something I’m interested in exploring. It has a fine cast. Shailene Woodley puts a lot of heart into the role and makes the most of the script. Theo James lends strong support as the monotone Four with a little secret of his own. Kate Winslet is wonderful as cold and antagonistic Jeanine Matthews and Christian Madsen is effective as the tragic Al. Divergent shows a world that I’d like to learn more about and features characters in horrific situations but I wanted the film to go further into the characters, to give the actors deeper material to work with that would examine the brutality of this world more closely. All that is a missed opportunity to me and hopefully the filmmakers can put more depth in the upcoming sequel.